A couple of months ago, I received what amounted to a care package from CR Brands due no doubt to my involvement with Mean Green and Roto-Rooter. 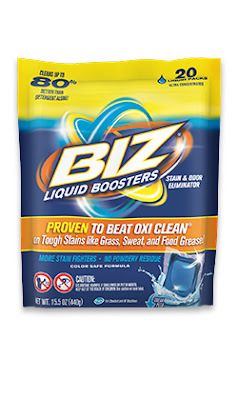 In that package, among other goodies, were a box of Biz Powder and a bag of Biz Liquid Boosters. I’d heard of Biz but I never really gave it a whole lot of thought. I’m a Tide user after all and my thinking was always that if Tide can’t getting my laundry clean then nothing can. As a good Proctor and Gamble customer I’d learned to trust and never question the wisdom of my laundry overlords. Quite honestly, I want my laundry to be clean and I don’t want to give it a whole lot more thought than that. But the freebies piqued my interest and so the next time I did a load of whites I threw a Biz Liquid Booster pod into the machine as a test. As soon as I did it I moved onto other things and promptly forgot I’d added Biz to my laundry. As I was folding that load of whites a couple of hours later I couldn’t help but notice my whites were indeed whiter. I’m a big fan of Clorox for whites and I thought the Clorox and Tide combo was the ne plus ultra of laundering whites but I was mistaken. Clorox, Tide and Biz make socks and towels radioactively white. It’s insane how white my kitchen towels in particular were. I cook a lot and I mean a lot as you may have surmised and I am particularly brutal on my kitchen towels. I use the flour sack towels and I usually replace them every six months or so because eventually, they get so stained that nothing will get them clean. But I’m telling you, those Biz Liquid Booster pods tore through really difficult stains like cocoa and dried milk. So I kept using them and each time I used them on both colors and whites, my laundry came out looking better and better. As I tore through my bag of pods I started using the box of powder I’d received and frankly the result was the same. I sound like a shill but I had cleaner laundry than I ever thought I could have. The samples I received have turned me into a lifetime customer and my laundry doesn’t feel like it’s been done properly without it. Biz Powder, Biz Liquid and Biz Liquid Boosters really work as promised and I say that as a typically skeptical shopper and consumer. Biz is a product that’s been around a while, since 1968 in fact. It was invented by a Proctor and Gamble chemist and consists of a proprietary blend of enzymes, peroxide and detergent and those things work in concert with the laundry detergent you already have. The enzymes power through protein based stains, the peroxides make dye-type stains disappear and the detergents scrub through mud and dirt. It’s a winning combination that actually works. You can buy Biz powder in most grocery stores and big boxes and it’s easy to use, even with front loading, HE machines like mine. The instructions are written clearly on the box so be sure to follow them if you have a front loader. Follow this link for $1 off coupon that ought to help your buying decision. Many of the stores that carry the powder also carry the liquid and it works the same way as the powder does. The Biz Liquid Booster pods are a bit harder to find but start requesting them from your grocery store. If enough people make enough noise about it, they’ll start carrying the pods as well. 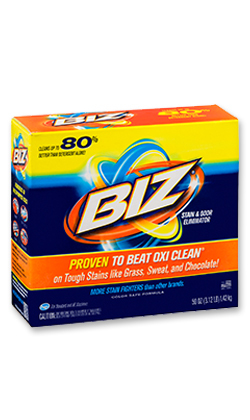 Just remember that Biz is a laundry additive, not a detergent in its own right. It helps your laundry detergent do its job better. 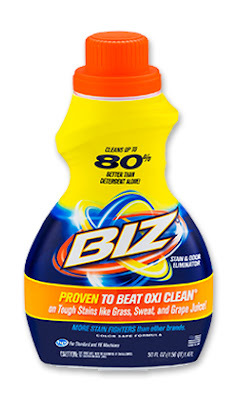 Biz powder and liquid have uses other than the laundry too. Biz powder dissolved in hot water made short work of my kitchen floors and cabinet doors when I put it through the test a couple of weeks ago. The package label has instructions for more of those other uses if you’re so inclined. My involvement with CR Brands this year has been an eye opener for a host of reasons and the products I’ve tried out with their help really do work and in the case of Biz, those samples have turned me from a tester into a customer. So go get Biz-y and excuse my bad pun.